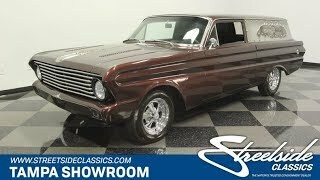 Hi, I am interested in your 1965 Ford Falcon (stock #1688-TPA) listed on Autotrader for $28,995. I'd like to get more information about this vehicle and confirm its availability. Upgraded to be truly sinister, this 1965 Ford Falcon Sedan Delivery is a head-turner for both its custom look and rarity. And as you look over all the work, including the powerful V8, overdrive transmission, custom paint, and comfy interior you soon see an all-around solid classic. This was the last year for the Falcon Sedan Delivery. It had fallen out of popularity, which creates a truly rare sight today. In fact, there are records that indicate this is less than one of 650 produced. Oh yeah, thats supercar kind of rarity in a classic Ford. But you want this one for much more than production numbers. It has a great custom look that starts with the paint. Black cherry means you get a dark attitude, but still get that hint of attention-grabbing red whenever the sunlight hits it. Plus, they utilized the dip in the Falcons hood for a terrific custom silver air brush package of cogs and skulls that tells you this is a mean machine. This same artistry is covering the side panels and wrapping around the rear to draw even more attention to this rare body style. More than just the paint, you have a great custom slick style with straight panels that are highlighted further by shaved door handles, expertly deleted trim, Cadillac bullet-style taillights, a deleted rear bumper, smooth billet grille, and a custom-integrated front bumper. Plus, this sleek style is furthered by performance touches like the slotted hood and Cragar SS wheels. So expect people to spend plenty of time looking at this one, because its a full custom build. Inside is a clean and comfy black interior. A rear seat means this sedan delivery has room for both cargo and friends. And youll enjoy custom details like the gold stitching on the seats and the tuck & roll style patterns on the side panels. You get the tight comfort features with a full power window package (including one for the rear tailgate,) an AM/FM/cassette stereo tucked away in the glovebox, and provisions for air conditioning. And the wood-rimmed steering wheel and ratchet-style floor shifter let you know theres something special under the hood. The Falcon was the father of the Mustang, and this one reminds us by how nicely the 289 cubic-inch motor fits in the engine bay. This hardy V8 has been upgraded with a Holley four-barrel carburetor, Edelbrock intake, MSD ignition, serpentine belts, and a nice set of headers that feed the rumbling H-pipe dual exhaust. All this extra power is what you want on a car that looks this mean, but theres much more here. It also has upgrades for front disc brakes and a four-speed automatic transmission w/overdrive. So this is a great cruising package. Serious rarity meets with a seriously cool custom look. This V8 Falcon is the one youve been waiting for, so dont let it slip away, call today!